Movie Review: Sicario (2015) | Generation Film! As Sicario opens with its ominous tone, we’re introduced to the arcane title and its appropriate definitions. The first alludes to a group of Jewish Zealots, who hunted Roman invaders under cover of shadows during the Jewish-Roman war in A.D. 70. The second definition–a straight-to-the-point and poignant one, for the film’s purposes–means “hitman” or “assassin” in Spanish. Utilizing these definitions, Québécois filmmaker Denis Villeneuve has allowed his exceptionally constructed topical thriller to take on a broader, more intricate view of the war on drugs than most vague executions. All of Villeneuve’s films are quiet and powerful meditations on difficult subject matters, with varying degrees of success, but Sicario closely resembles his Oscar nominated Incendies (2010) (examining the effects of war in Lebanon on future generations). 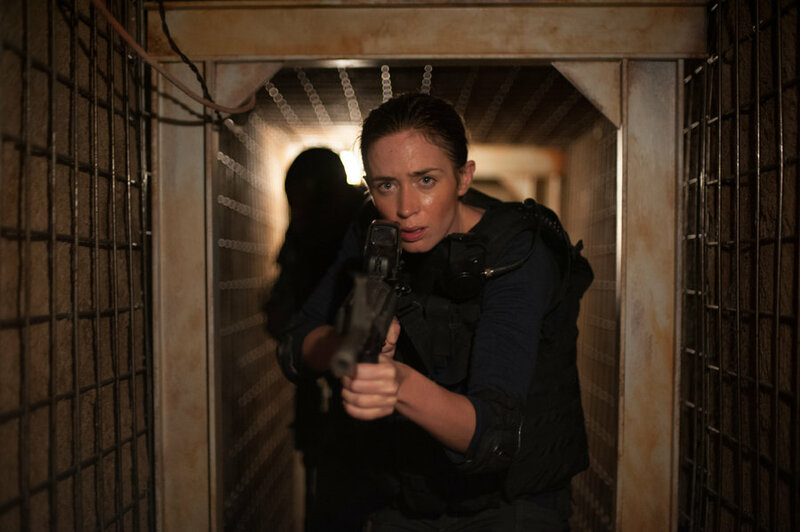 Sicario aims to go beyond legal jurisdictions and political platitudes of the drug war, to effectively highlight a deep moral plight on both sides of the U.S./Mexican border. Villeneuve’s film unfolds the futility of this war, the moral ambiguity that follows, and the modern human tragedy that results. Villeneuve’s most effective piece within Sicario is his consistency in bringing everything back to human consequences, to ensure that his audience comprehends the true disaster occurring when moral ambivalence meets political necessity. That misfortune results in a constant circle of violence, retribution, and lessons unlearned, as the effects of the drug war jade the vision of its practitioners, and devastate those indirectly participating in it. This poetic vision is all done with Villeneuve’s atmospheric and tactful hand as the technicality superbly involves the senses, from the existential emptiness of the sun-scorched earth to the heart-pumping sound effects created through the sinister tones of Johann Johannsson’s exceptional score. Teaming up again with illustrious cinematographer Roger Deakins (last together in Prisoners (2013)), Villeneuve gives Sicario a merciless level of suspense, utilizing violence so effectively you can almost smell it in Deakins’ grim framing. Sicario grips you from its haunting beginning to its bleak end, as Villeneuve grabs hold of your senses, only allowing you to breathe when it is absolutely necessary. Though Prisoners (2013) brought Villeneuve to national attention with its equally bleak and gripping style, Sicario’s composure of elements is far superior–message, technicality, and especially acting. Guiding Villeneuve’s penchant for reflective vision is a thought provoking, but equally thrilling, script from first time screenwriter Taylor Sheridan, smartly blending the bravura of an action film with the atmosphere of an art-house picture. 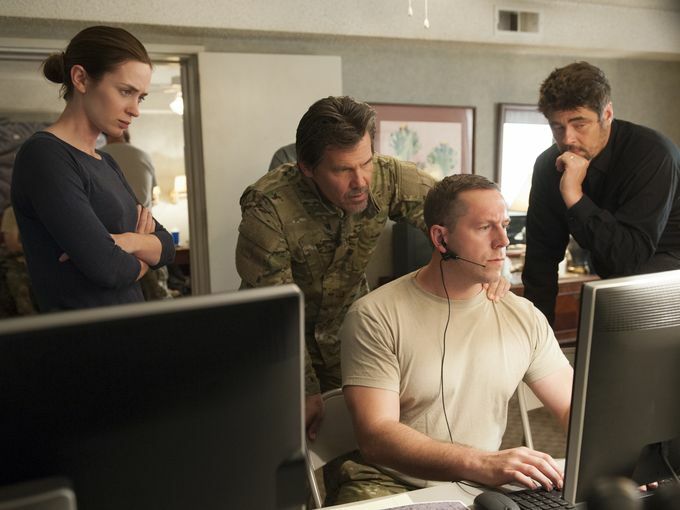 The palpable exterior thriller blurs the line between noble intentions and skewed morals, and at the heart of it all are three very different characters who experience the effects of the war on drugs, including DEA agent Kate Macer (Emily Blunt), federal overseeing officer Matt (Josh Brolin), and the covert, quiet presence of Alejandro (Benicio Del Toro). The film puts Kate’s devout sense of right and wrong against both Matt and Alejandro’s experienced moral relativism, while analyzing the limits of the human soul within the heart of darkness that is Juarez. Sheridan’s script allows essential characters to have personal motivations they can explore effectively through performance, yet never allowing everything to be exposed too soon. Alejandro, played by the always grand Del Toro, is the stone-cold ex-prosecutor-turned-assassin with haunting pragmatism to steer his moral composure, and his quick-of-the-draw gunslinging talent is an imminent threat, tonally constricting throughout the film. Both Del Toro and Brolin dedicate themselves to unlikable and hard to swallow relativism, bringing the point of the film to philosophical crossroads; and, though Blunt’s character is immensely underwritten–deliberately bringing black and white idealism to a morally grey gunfight–she portrays Kate with subtlety and hard-lined nuance, proving she can blend emotional clarity with heroic action, as she did with last year’s under-appreciated Edge of Tomorrow (2014). Together, these players (along with a fine cast of familiar faces) give life and consequence to a problem that can seem markedly far away or too complex to solve. 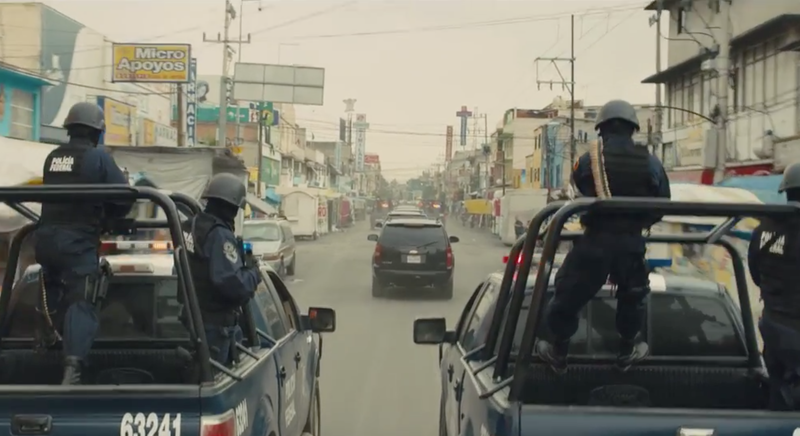 Villeneuve isn’t seeking to solve the political complexities within the war on drugs, nor is he attempting to give plausible answers; Sicario highlights the fact that we are lacking of the right questions. It is refreshing to see Villeneuve tackle difficult subject matter with a near-pristine cinematic touch when most movies today trade in thought provoking complexity for sensationalist extremes, whether for partisan politics or to avoid risk. His strong sensibility and emotional dedication are a lost art, giving Sicario its living soul where the moral consequences, the human loss, and the metastasizing corruption are all felt with undeniable weight. Though Sicario will undoubtedly be compared to the overrated Steven Soderbergh film Traffic (2000), Villeneuve’s film is far more important because it does not feed you preconceived answers. Instead, Sicario reveals the hard felt realities of the drug war, with its complexities and consequences, to allow personal contemplation of whether or not this is a war that deserves to be fought.